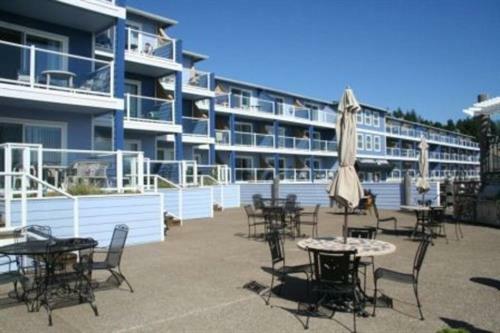 Come home to the beauty of Newport, Oregon with The Landing At Newport! These luxurious bridge-view condominium units feature fully equipped kitchens, gas fireplaces, private balconies, internet access, DVD's, a meeting room, patio with crab cookers and BBQ's. Most Condominiums have washer/dryers. Newport boasts a million-dollar fishing fleet where you can buy seafood right off the boats. There's a beautiful scenic harbor that's alive with both day and night activities, wonderful shops and restaurants, outstanding galleries and, of course, the sounds and sights of a busy bay front. Nestled in the most protected area of this Bayfront is the condominium project known as The Landing At Newport. 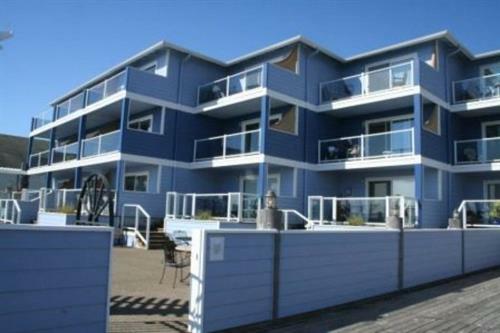 Off the balcony deck, you will look over the sport fishing fleet, across the charming Bay and have a direct view of the beautiful Yaquina Bay Bridge. Often reaching summer temperatures as much as ten degrees warmer than on the beach, this area is usually immune from the summer coastal fog. If you are the type of person who enjoys fabulous views, charming shops and restaurants, modern facilities and peace of mind, The Landing At Newport might just be for you. We invite you to browse through this website for more information on The Landing At Newport, also visit the photo gallery page to see pictures of our beautiful condominiums and scenery. To make your reservation, visit our website or give us a call. Highway 101 and Highway 20. Turn East on Highway 20 to first light, turn right. Follow to the bottom of the hill to The Landing at Newport.